This year will mark the 3rd year for the Winans to Winans Half Marathon. The half marathon starts in Troy, near Winans’ downtown Troy location. The 13.1-mile course winds through parks in Troy, connecting with the bike path and running past the historic Eldean Covered Bridge, following the bike path to finish in Piqua. The race ends at Winans’ Hometown Store + Tasting Room in downtown Piqua. Race participants receive a t-shirt and their choice between a race medal or a travel coffee mug. At the finish runners and walkers are rewarded with beer and sweet treats from Winans Chocolates + Coffees. Xcel Sports Medicine will be on site to answer injury questions and give short post race massages. Winners in each group are awarded beer growlers with the Winans to Winans Half Marathon logo emblazoned on them. The top three finishers overall will have their growlers filled with beer. 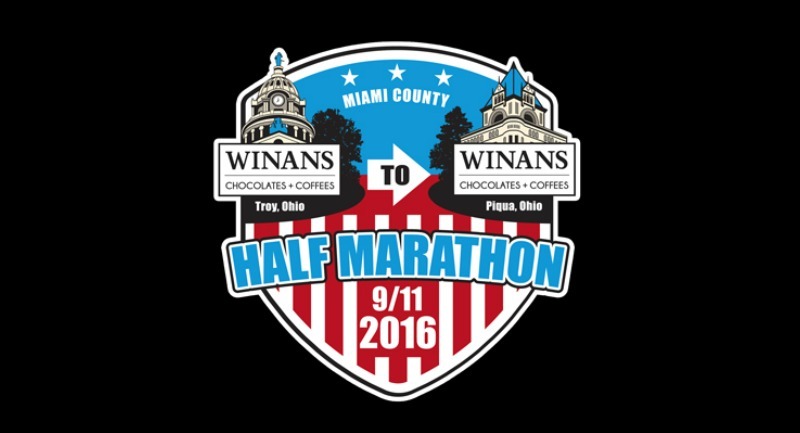 The concept for the half-marathon was brought to life by Joe Reiser, co-owner of Winans Chocolates + Coffees. Joe says that running is “just one of those things that are part of my life that I’ve shared with the business and now the business has taken it into other people’s lives.” Joe brought his passion for coffee to Winans in 1994, coffee now makes up 50% of our business. In the past several years he has brought another passion, running, to the Winans family. Joe started running when he was 18 and a freshman at The Ohio State University. He saw people running around on OSU’s beautiful campus and thought it looked cool. Running quickly became a part of his life. He didn’t run races, he just ran for his psychological well-being. Running became Joe’s way to keep his mind clear for studying for exams and a way to destress, which he continued to do after graduating college. The idea to host a half-marathon started about seven years ago. Joe wanted to host a marathon from one Winans store to another. He mentioned his idea to Levi Fox. Levi had an office over the downtown Troy Winans location and was a former cross country star at Troy High School and state champion runner. Levi, familiar with the intense amount of work involved in setting up and running a marathon (both the logistics and the actual running) instead suggested they start a running group. The Winans running club started in February 2011 and has been going strong ever since. The group philosophy is that there are no dues, no membership and you don’t have to attend every week. The one and only rule is that they meet every Saturday morning at downtown Troy Winans; if you run or a walk a mile you get free coffee. The running group has become an extension of the Winans family. Some of the runners were not coffee drinkers before joining the group, and they are now die-hard Winans coffee drinkers. They support each other in races and they get together to celebrate birthdays and other holidays, usually in the back of the Winans store in downtown Troy. The two met up with friends to go eat lunch, while runners were still finishing the race. While sitting in the restaurant, they heard a loud boom. Joe thought it was a dumpster being emptied or construction. Laurie was concerned. After another loud boom, they saw people running in the streets. The Boston Marathon bombers had detonated two bombs near the finish line and race finishers were being rerouted down the street that the Reisers were eating lunch at. Joe and Laurie tried to help the rerouted runners, who were confused and upset as they tried to finish the final portion of the marathon. They also tried to help runners and spectators find their hotels – even though they aren’t from Boston and weren’t familiar with the area. When Joe and Laurie returned home, the local press found out that they were at the bombing. They interviewed Joe and he told them that “we’re dedicating our running group this Saturday to Boston.” He had no idea how far that simple statement would reach. The next Saturday morning, almost 200 people showed up in downtown Troy for the running group. They wore blue and yellow and brought balloons and signs that read “Backing Boston from Ohio.” Some runners starting throwing money on the counter in the store, Joe quickly asked a fellow runner to collect the donations. They raised $2,000 and an anonymous donor matched it. They sent $4,000 to two young men who were spectators who lost their legs in the bombings because Joe and Laurie were spectators. The next year Winans’ first half marathon was held on the second Sunday in September. Winans hosts the marathon but does not make any money off of it. Levi Fox’s company organizes the race and takes on all of the work organizing and planning the race. Every year the half marathon has grown. In 2014 about 300 people participated. The next year 400 people ran. This year we’re expecting over 650 people! If you would like to join us for the 3rd Winans to Winans Half Marathon on Sunday, September 11th, check out all of the details to register here. Everyone loves chocolate and coffee... share with your friends! The best resource for premium chocolates, fresh roasted coffees and gifts that delight.